"Wendy Carle Taylor’s voice, presence and musicality are so special that it is a real challenge to adequately sum up her one woman show at Brunstfield Evangelical Church. Carle Taylor and her two-piece band (Graham McDonald on piano and Sandy Butler on guitar) not only achieve musical perfection but create an experience that is both moving and uplifting. It is tempting to describe Carle Taylor’s voice as ‘powerful’, but this actually does it a disservice, as it suggests a lack of sensitivity or versatility. It is more that her tone has a natural strength – it is dark, rich and naturally soulful – which she allows to come to the fore. Her voice also sounds wonderfully free, with a clear and fast natural vibrato and exceptional mobility. To speak in technical terms however risks diluting the emotional impact of the evening. When Carle Taylor sings, she thoroughly immerses herself in the lyrical and musical content of the pieces – she is not simply a singer, but an interpreter and storyteller. Wendy Carle Taylor has an incredible ability to reinterpret well-known works in her own distinctive style whilst keeping the songs themselves at the fore. The show is never about her, it is about the music and the words; an approach which is something of a rarity among modern female vocalists, and therefore very refreshing. A particular favourite of mine was her version of Neil Young’s ‘After The Gold Rush’, a song so complex that even Young himself has confessed to not knowing exactly what it means, which she sang with such depth and range of emotion that I was replaying it several times over in my mind later that evening. Although it has been covered many times since Young’s original – including a Grammy winning rendition featuring Dolly Parton, Linda Ronstadt and Emmy Lou Harris – Carle Taylor’s version has immediately become my favourite. Some singers, particularly new additions to the folk and jazz circuits (although the problem is of course also prevalent in pop) have a tendency to sing with an affected and almost artificial tone, so intent are they on carving a stylistic niche for themselves. I never once felt that Carle Taylor was singing in this way – she sings with her own voice and so her sound is very real and personal. I doubt there are many, if any, other artists who would be able to sing songs by Janice Joplin, Bobby Burns and Paul Simon all in one evening with such effortless grace. Carle Taylor’s stage presence is as adaptable and versatile as her voice; one minute she can be having a cheeky and candid chat with her audience, the next she is an ethereal songstress of the highest degree. With every piece she transforms the space; it is possible to feel a tangible change of atmosphere in the room within a few lines of each new song. That she reaches out to her audience and invites them to join in for some songs is demonstrative of this – and it’s an invitation which never feels forced or insincere. By far the biggest strength of Carle Taylor’s audience relationship is, however, that wherever she goes in performance she takes us with her; be it taking us on a jolly romp through Paris with a French favourite or keeping our feet firmly on the ground with a sombre and poignant delivery of Eleanor McEvoy’s ‘Only a Woman’s Heart’. It takes a very special performer to unlock music’s potential to really transport the listener, and Carle Taylor does so with ease. She is simply sublime from start to finish." "I love the name Wendy. J. M. Barrie popularised it with Peter Pan, drawing it from Margaret Henley’s baby-talk: ‘friendy-wendy’. Wendy Carle Taylor is one such ‘friendy-wendy’. For an hour or so, nothing else matters but her enchanting voice and encompassing warmth. The set consists of songs chosen for their connection to the search for life’s meaning. The first song is utterly joyous despite it being about finding love in a bleak council block stairwell. Taylor smiles throughout. The tantalising intro into the next song starts on a harmonium. Then the guitar and clarsach join in, taking the audience to a far-off, mythical place. It is ‘She Moves Through The Fair’, but a version so vocally pure and so emotionally resonant that it strikes the very soul. I have never heard it sung with such other-worldly melancholy: it was ethereal and enchanting..."
"Wendy Carle Taylor gave an outstanding performance of some of the best known songs composed by Carolina Oliphant, Lady Nairne of Gask, of which a moving and beautiful "The Land o' the Leal" was undoubtedly the highlight." 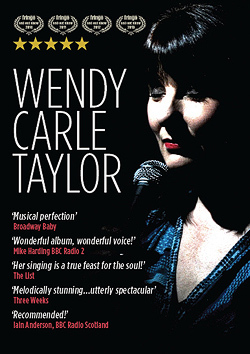 "Wendy Carle Taylor interprets Scottish, Irish and French songs inspired by poets such as Robert Burns and Jacques Brel. Ranging from an anti-slavery song to an allegory for Nazi Germany, Wendy’s choices were not only melodically stunning but meaningful, too. An incredibly warm, smiling personality who encouraged the audience to join in, she also has a voice which is utterly spectacular."